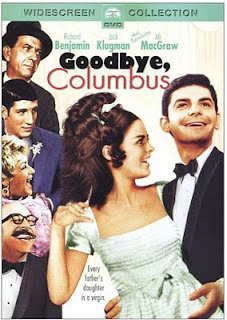 In journeyman television director Larry Peerce’s Goodbye, Columbus, based on the short novel by Philip Roth, the underappreciated comic actor Richard Benjamin plays a New York librarian who falls for an out-of-his-league Jewish Princess played by Ali MacGraw, in her very first film appearance. Although both are ostensibly Jewish, and New Yorkers, they come from different worlds. The film explores the culture clash as the two attempt to move in one another’s circles, and the havoc, internal and external, that occurs when they can't seem to make a go of it. I was pleasantly surprised by Peerce’s craftmanship — he paces the thing properly considering the lazy plot and episodic structure. He also deftly handles the story’s mildly uncomfortable transitions from the serious to the melancholy to the humorous — most of which is on the wry side. There are a few particularly good moments, again worth noting that the best of them don't involve MacGraw. My favorite finds Benjamin at work in the library, quietly ingratiating himself into the life of a young boy who visits the library in search of art books. 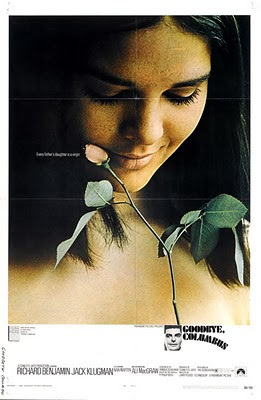 The initial scene in the subplot suggests a break for comedy, but as the text develops we realize it’s one of Goodbye’s best moments. I finished the movie wishing more such interludes had been included, and wondered if there wasn’t some potential for another film in there somewhere, or if, at least, a few scenes hadn’t been sacrificed and left at the altar of running time. Another good scene finds Benjamin visiting Klugman at his place of business: a Bronx plumbing supply company — down, dirty, and a million miles away from the family mansion-ette in Westchester — it’s Roth’s nod of respect to those folks who do things the hard way, and a subtle reprimand to those Anglos who believe affluent Jews don’t earn their pay in the way everyone else does. In the scene, Klugman is measuring Benjamin up for a spot in the business, and their tense interaction give the older actor the chance to show his chops. The characterization is on the money: Klugman says all of the things to Benjamin that he really just wants to say to his own son, a spoiled sports junkie who thinks he’s too good to work in the family business. Benjamin knows this, and out of respect for the older man he lets it all hang in the air — as an actor Benjamin is a great listener, and it’s never more apparent than here. His character serves as something of a lens into the kinds of lives Goodbye portrays, Benjamin is consequently quite well-cast. In the end the movie seems to be a vehicle through which we learn more about how Philip Roth sees (and rails against) his own place in New York’s Jewish culture (it’s worth noting that in the novel Roth places his characters in slightly less movie-chic town of Newark, New Jersey) than we do about the human emotions of the two young lovers, their rather clichéd families, and what’s really going on in anything less than a superfluous way. It’s a film of loosely connected moments — some of them are very rewarding, but the whole doesn't measure up to the parts. Those looking for a straight comedy from the same period should instead consider Lovers and Other Strangers.